We Malaysians love our food; or in more direct terms, we love to eat. A few months back, I wrote a post about some of our favourite dishes and received quite a number of positive feedbacks from readers the world over (see Malaysia to the world: Our favourite dishes). Encouraged by this and as suggested by one such reader in Poland, I'm now going to share with you some of our favourite desserts. Malaysia is home to a multicultural society and hence, there truly is so much to choose from here with regards the stuff we put into our mouth after our lunch or dinner - or simply as something to satisfy our seemingly blind, endless cravings for food in-between meals. Every ethnic group here has its own variety of desserts; and whilst individual palates and tastes do vary, by and large we Malaysians as a whole love literally everything where desserts are concerned. You see, we loooove sweet stuff. The sweeter the better. It's therefore no coincidence that Malaysia has one of the highest rates of diabetes on the planet; and although awareness is on the rise, in reality only a minority view this issue with any significant degree of concern. Or fear. If anything, most Malaysians go by the Chinese saying "eat first, bear the consequences later" ("吃了才算") when it comes to food. But that's a story for another day. Today, I'm here to tell you about our fabulous desserts; five of them to be exact. The first dessert I'm gonna talk about is BUBUR CHA CHA (pronounced "boo-boor cha cha"). 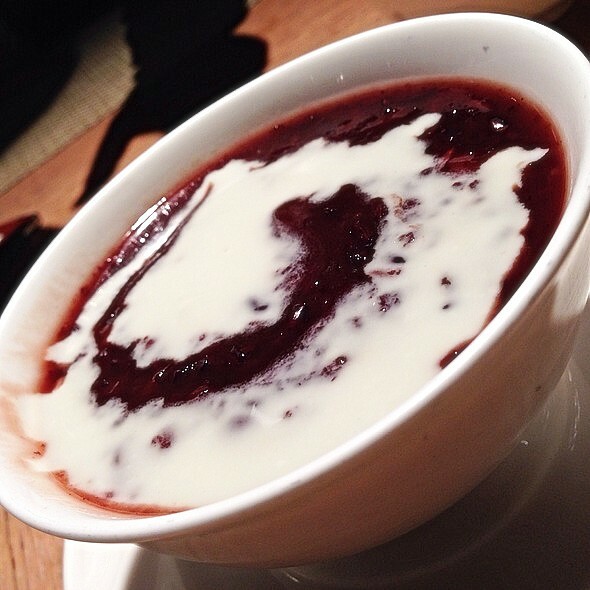 The term "bubur" means "porridge" which this dessert takes the form of. 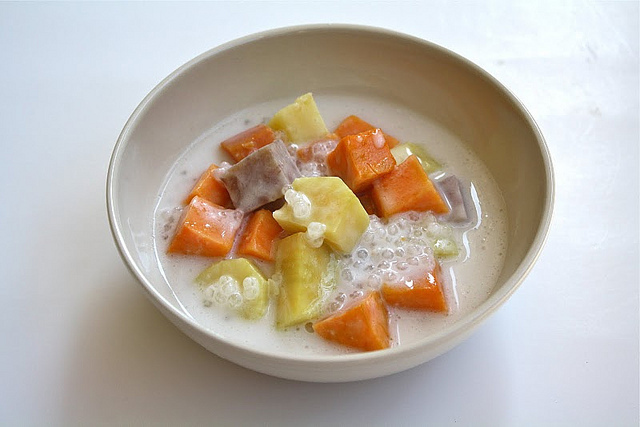 This dessert - which can be served warm or cold - is basically sweet potato, taro and yam cubes served in coconut milk and sago. Taro is a tropical Asian plant of the arum family that has starchy edible corms and fleshy leaves that are also edible. I prefer my bubur cha cha cold, i.e. refrigerated or with ice cubes, but most would beg to differ on this note. At the end of the day, it's merely a matter of personal taste. Either way, it tastes great. Bubur cha cha is terribly easy to prepare and is mind-bogglingly tasty - due in no small part to the sweet taste and fragrance of the coconut milk. This dessert is a timeless classic in every sense of the word; I can still remember my late old man making it as a TV treat all those years ago and despite the passing of time, it remains an immensely popular dessert to this day. Trust me; everybody loves bubur cha cha - locals and visitors alike. It's that good. 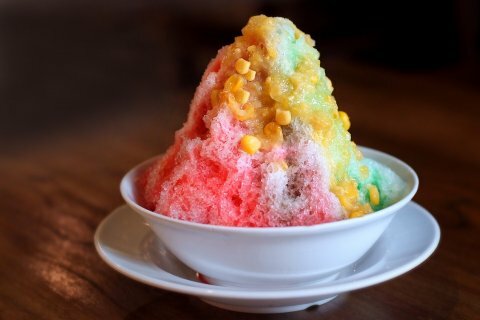 Next up is our AIS KACANG (pronounced "ice car-chung" - rhymes with "lung"); arguably the best Malaysian dessert one could possibly have on a sweltering equatorial afternoon or evening. To be honest, not everyone is a fan of ais kacang; but that's probably because those who shun it suffer from sensitive teeth in the first place! You see, 85% to 90% of this dessert is made from shaved ice; topped with evaporated milk and a variety of syrups. 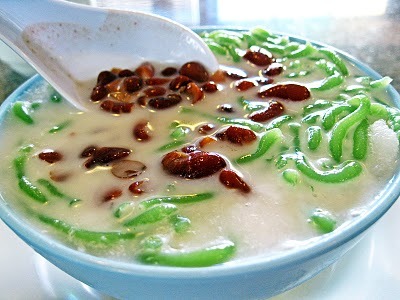 Its main ingredients include coconut milk, red beans, glutinous rice, grass jelly, creamed corn, palm sugar and "green noodles" - a worm-like jelly made from rice or green pea flour with green food colouring (see "Cendol" below). How good a bowl of ais kacang tastes really depends on how well the syrup topping is prepared. Making good, sweet, fragrant syrup is an acquired skill and unfortunately not every vendor makes agreeable syrup; so do ask for recommendations from the locals before venturing out for your first ais kacang. Find the right one, however, and you're in for the treat of your life. The third dessert I'm gonna introduce here is CENDOL (pronounced "chen-doll"). This dessert can be found all over South East Asia but is especially popular in Indonesia, Singapore and of course, Malaysia. Don't let those green stuff put you off; they're actually strands of cooked dough made from rice or green pea flour (noodles, essentially) and coloured with the green juice of pandan (screwpine) leaves. Made properly, they have a rubbery texture that's really quite pleasant on the palate. A standard bowl of cendol typically consists of these green noodles, red beans, coconut milk or cream, shaved ice and - my favourite - palm sugar. Commonly available as street food, cendol is always a welcome dessert in the hot, humid weather of Malaysia. 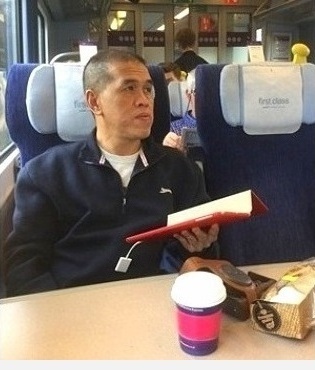 SAI MAI LOU (pronounced "sigh-my-low") a.k.a. "honeydew sago" is another Malaysian favourite. 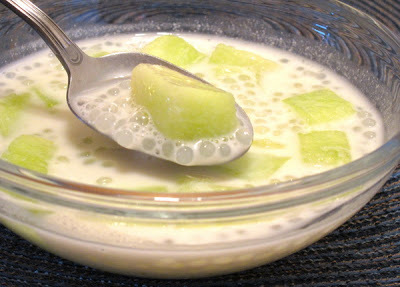 Refreshing and absolutely divine, this dessert combines the sweetness of fresh honeydew melons and the jelly-like texture of sago (or tapioca pearls); served in a refreshing, superbly-fragrant concoction of coconut milk, evaporated milk and sugar syrup. Sai mai lou tastes especially good when consumed cold; and because it's so easy to prepare, is often served at house parties where it never fails to impress. You're gonna love this one, I promise. I've left my personal favourite - BUBUR PULUT HITAM (pronounced "boo-boor poo-loot hee-tum") - for last. 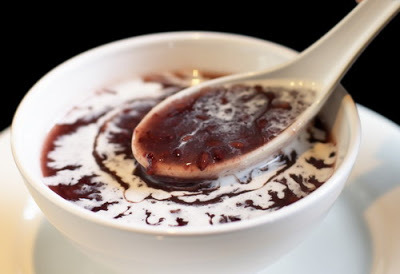 The name of this dessert literally translates into "black glutinous rice porridge". As its name implies, it is made from black glutinous rice cooked into a porridge form with a small amount of pandan (screwpine) leaves thrown in for flavour, and then topped off with rich coconut cream (or sometimes evaporated milk). Outwardly, it may not look very appealing but trust you me, this is undoubtedly the most heavenly dessert you'll find in Malaysia. The grains of the black glutinous rice have a slightly rubbery texture which, with each spoonful and together with the rich, concentrated coconut cream, tastes maddeningly wonderful. Best taken warm, you will surely love this heart-warming dessert once you've tried it - which is a definite MUST if ever you come this way. So, there you have it; arguably the top five desserts here in Malaysia. All of them can easily be found in food courts as well as at street stalls all over the country, and typically cost about USD1.00 to USD2.00 per serving - usually a bowl. 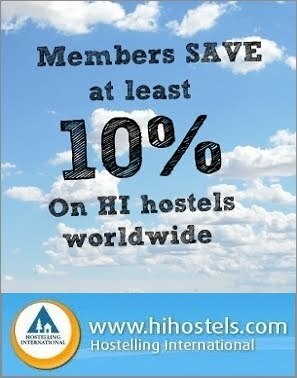 You'll also find them on the menu of many major hotels in Malaysia but do expect to pay a significant premium for these. Personally, I prefer those sold as street food, because more often than not, they're prepared the traditional way which (to me at least) is the only way; no fusion rubbish. The trick is to just turn a blind eye to your less-than-appealing surroundings and you'll be on your way to enjoying some of the best desserts my country has to offer. It's hot out today; ais kacang, anyone? Have you visited Malaysia before? If so, have you tried any of the desserts above? Which one did you like most (or least) and why? Thank you. They are indeed.